I went into the park with a hyped-up sense of anticipation and left with a love-hate relationship with the Smokies. From the Spence Field Shelter, crossing up over Rocky Top hiking through to the observation tower at Mount Cammerer is some of the most beautiful hiking I’ve done. The environment is lush and mossy, and is a pleasant place to be. For me it was reminiscent of Washington state, a place I love, and to experience this forest environment in the park was not what I had envisioned. The 70-odd mile traverse only crosses one road at Newfound Gap. The lack of road crossings provided a greater wilderness character to this section. 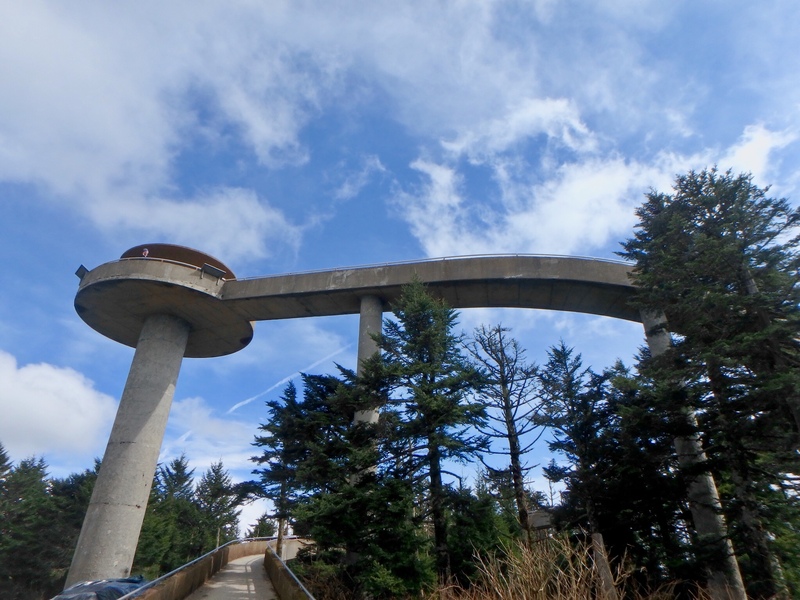 Observation saucer on Clingmans Dome. Great Smoky Mountain National Park. I also crossed Clingmans Dome before the road was open. Thus, the AT hikers had the place to themselves. I was fortunate to cross over on a clear day so in addition to the views the experience was unencumbered by hordes of tourists. I’ve been in parks hiking and to come across gawking tourists can be a bit… much. Almost all the hikers I’ve talked to are frustrated with the shelter requirements. Everyone must purchase a permit, which is not big deal. However, it is mandatory to stay in the shelters. But priority is not given to those who arrive first, as is the implicit rule of all shelter stays on the AT. Rather, first priority is given to folks who reserve spots within the shelter. Now these other hikers may not show up at all, as was the case at Mount Collins Shelter. Crammed into a corner of Spence Field Shelter. A shelter for 14 held at least 21. Great Smoky Mountain National Park. I rolled up on Mount Collins Shelter ahead of rain that was to last most of the night. When I arrived the shelter was basically empty, but the ridge runner informed me that the shelter was reserved by at least eight people and there may not be room for thru-hikers. So that night I slept outside while the shelter remained below half capacity. I did this because of what is explained by my experience at Pecks Corner Shelter. The day I arrived at Pecks Corner it had been raining all day with a dense fog. In the evening the rain turned to sleet and then to hail and snow. Thankfully only one day of this in the Smokies, where winter still has its grip. But with the foul weather the shelter was well over capacity, with at least 16 people in a shelter for 12. Near dusk a group of four rolled in with a reservation so it was tough luck for the last four thru-hikers to arrive, as they would be shoved outside. 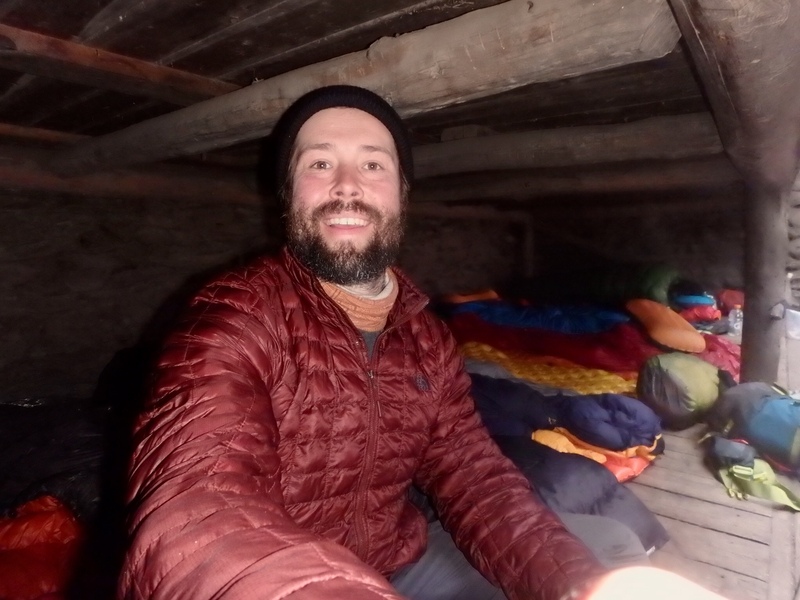 It was only clear who the very last person in was, and with him searching for a flat spot to pitch a tent, many others slowly pulled their sleeping bags up over their heads as if nothing was happening. Eventually three others volunteered to sleep outside to allow these others to stay in the shelter. I was of the three to volunteer. 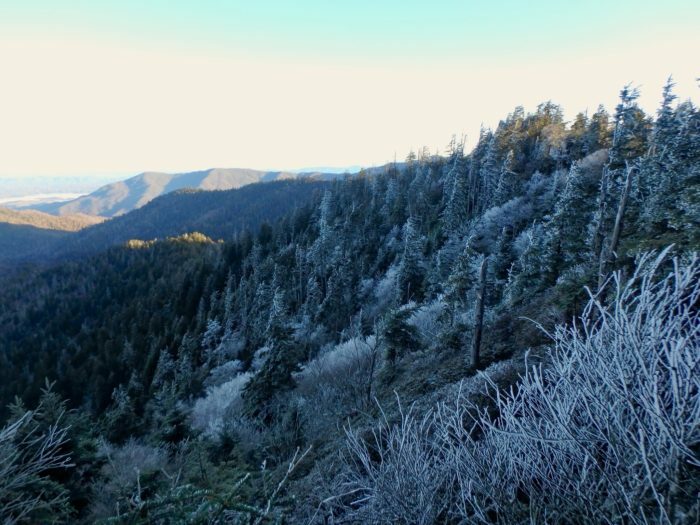 Smokies kissed by winter. Great Smoky Mountain National Park. I’ve stayed in a couple of shelters outside the Smokies and I don’t mind them when I don’t feel like I’m forced inside due to regulation rather than environmental factors. The shelter situation also has a sanitation issue, both real and imagined. The lack of privies at half the shelters creates a scenario where waste is being haphazardly dispersed in the vicinity of the shelter area. While there are designated toilet areas, the abundance of soiled Charmin blooms is both unsightly and unsanitary. These toilet areas are typically on the opposite side of the ridge from a water source, but many a good wind has blown waste across the ridge into the water area. I skipped a number of water sources because of waste in close proximity to water. The waste has likewise caused what I consider to be a tremendous bear problem in the park. I talked to a couple that had a bear come within 30 yards of their camp only to sit down in reaction to attempts to scare the bear away. Within days the Birch Springs campsite was closed and cautionary warnings are in place at Mollies Ridge and Spence Field shelters. I rolled up to Davenport Gap shelter on my last evening. Once I saw the chain-link cage on the front of that structure I ate my dinner, packed up, and walked across the gap and out of the park. I was fortunate when I came through the Smokys in 2016. I had mistakenly bought a regular permit, not a thru-hiker permit, which meant I had to (supposedly) specify exactly which shelter I’d be at on precise dates. Yeah, right. I was doing many more miles than I’d anticipated, so I literally never slept in any of the shelters I’d signed up for. So I ended up tenting at the Birches site between Fontana Dam and Mollies Ridge, then Derrick Knob and Tricorner Knob. But none was ever full (the temp at Tricorner was 17 degrees, and it was close to capacity). But I agree that the policy is ridiculous and doesn’t work well. They’re trying to balance the needs of thru-hikers with everyone else, but there has got to be a better way. And it is surprising indeed, given all the attention to the impacts of visitors, that so many of the shelters do not have privys. Good luck on the rest of your walk. Oh, duh: I also had a night in Gatlinburg.